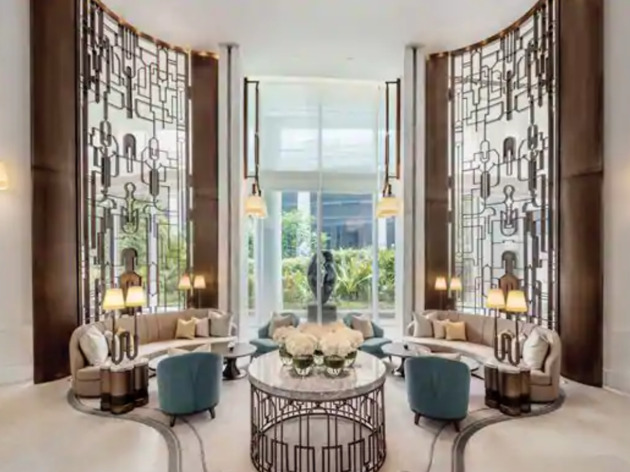 Bangkok's newest luxury hotel from an iconic brand blends the Waldorf Astoria legacy with local Thai culture, and boasts innovative cuisine and stunning design. 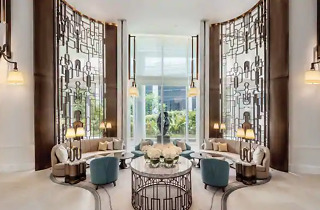 The stunning, brand-new Waldorf Astoria Bangkok shoots up from the bustling Rachaprasong intersection like a flower; in fact, it was designed to look like one—a magnolia, to be exact. Inside, design elements by Hong Kong-based architect Andre Fu—such as wrought iron sculptural panels and an assortment of intricate chandeliers—pay homage to local Thai culture as well as the Waldorf legacy. The property boasts 171 rooms and suites, each with interactive entertainment systems, well-stocked mini bars and sprawling bathrooms with rainfall showers, high-tech toilets and toiletries by Salvatore Ferragamo. Guests have access to three restaurants, two bars and a tea room lounge; our favorites are the Front Room, a lobby-level eatery serving innovative Nordic-Thai fare, and the top floor Champagne Bar, offering flutes of bubbly to be enjoyed on plush green velvet couches overlooking the city below. A small (three rooms) but lovely spa sits next to the open air, rooftop pool, scattered with giant wicker chairs and affording one of the best views from the property. There's also a 24-hour fitness center, as well as the aforementioned lounge, Peacock Alley, perfect for whiling away the hours between city exploration and dinner—look for the clock behind the bar, a quiet nod to the storied hotel brand's first property in Manhattan (every Waldorf Astoria has a version of the first location's beautiful wall clock). Time Out tip: Book ahead at the spa and the Front Room, both popular must-dos inside the hotel. At Peacock Alley, order butterfly pea tea for a tasty magic trick (the water changes colors as the tea brews! ).